What do Flower Crowns Mean? How It Ruled the American Era of Hippies in 1960? 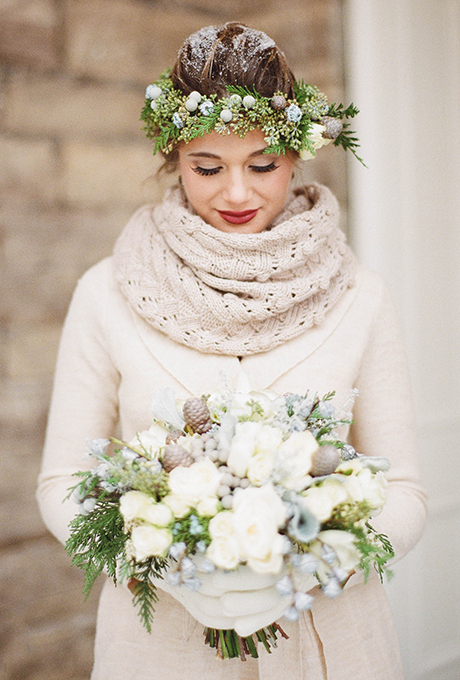 What’s There for a Winter Bride? What's with the Flower Crowns Trend on Tumblr? 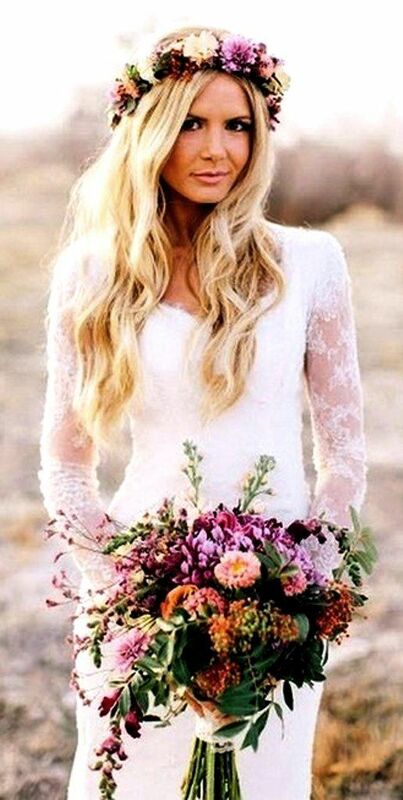 You must have noticed many whimsical or boho chic brides wearing flower crowns or floral headpieces on their big day. Most of us know wearing a floral headdress as a latest fashion trend, which actually is not the fact. And many of us do not know what do flower crowns mean. 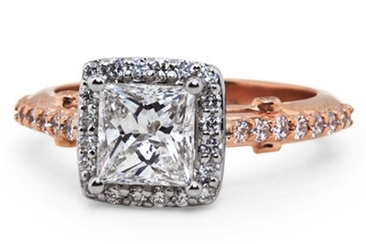 This vintage-look has its roots traced back to ancient civilizations. Today, more and more neo-hippie and gypster brides are opting for these decorative headpieces. Their purpose is just to have a different and unconventional look. Knowing, what history suggests about it, in art and mythology, is also significant. Let’s take a scrupulous look at the historic significance of a wedding flower crown. Flower crowns are a symbol of love, celebration, and fertility throughout history and all over the world. Besides, it's a beautiful piece of adornment that just adds to your romance and femininity. You can have each bridesmaid wear a different one, flower girls wear mini-crowns, and ask your hairstylist to incorporate one into your hairstyle. In ancient Greek, these flower crowns were considered a respectful way of honoring their gods. Secondly, these headpieces were awarded to the army victors for their great achievements. The most popular form of it was the laurel leaf wreath worn by none other than the great Julius Ceaser. In medieval times, various pagan religions used to embellish the statues of their gods with these floral crowns. These floral headbands were a part of traditional dressing of Ukraine. Young girls of marital age used to wear them. Other than that, newly married couple’s heads were adorned with them, once they have exchanged the wedding vows. Even today, many people do not have much idea of what do flower crowns mean. But still young girls choose these decorative headbands as a part of their attire on different festive occasions, including wedding. Traditionally, Chinese women used to wear orange-hued flowers crowns in a wedding. These orange blossoms were considered the symbol of fertility and lots of kids after marriage. The credit of introducing the flower crown in Victorian age goes to Queen Victoria. She got inspiration from the Chinese tradition (already mentioned above), and wore an orange flower crown on her nuptials to Prince Albert in 1840. 60’s was the decade rocked by gypsters, not only in USA but in UK too. Bohemian and hippie girls used to wear this gypsy headpiece to get a uniquely bubbly look. It influenced the mainstream fashion world greatly. Finally, the flower crowns got popularity among the masses, without having the basic idea of what do flower crowns mean historically. 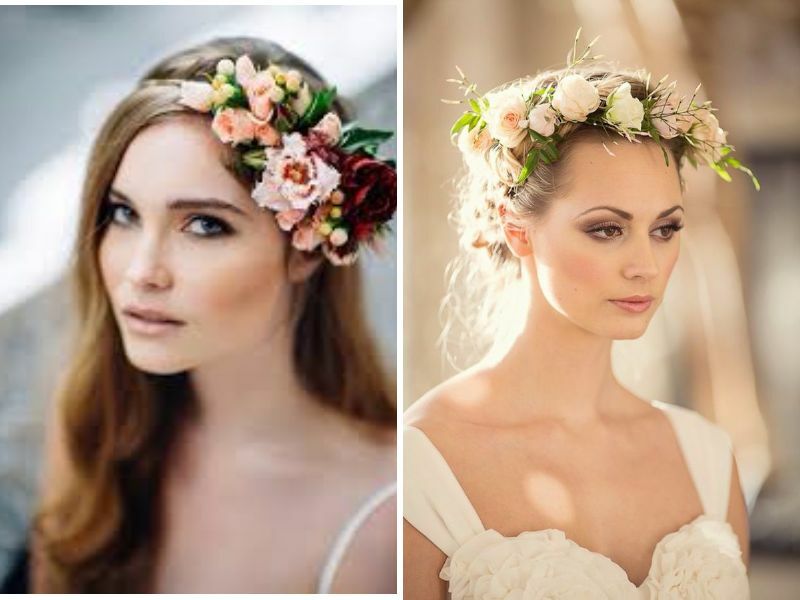 The popularity of these flower crowns is increasing day by day. It’s just not limited to bohemian brides, but bridesmaids also love to opt for this Greek goddess look. Wearing these floral headbands is an art in itself. 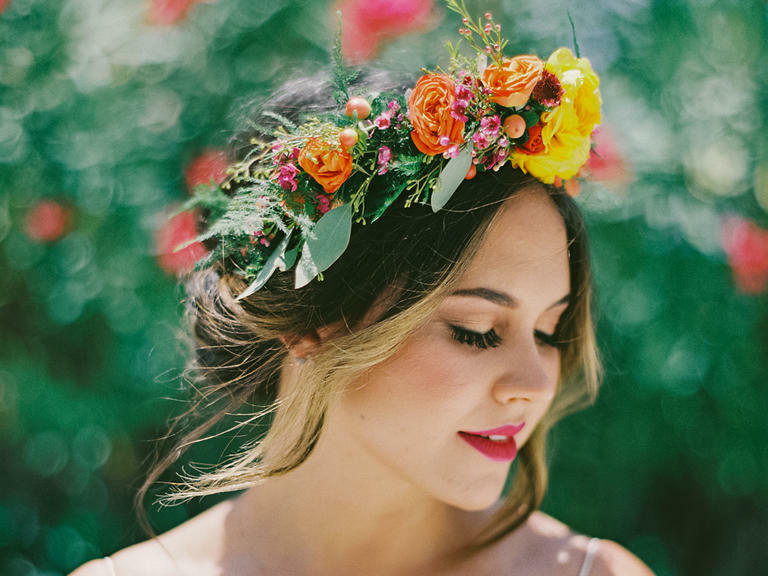 Check out a few tricks to get the best bridal looks with a flower crown. For a headpiece, making the choice of flowers, style and the hues should be according to your personal style. Who you are? What’s your style? Things like this should determine the final look. 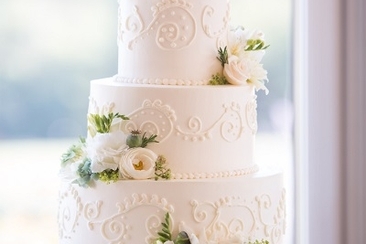 For example, an elegant and delicate bride should opt for soft hued flowers, most of all a wreath of tiny ivory flowers like baby breath (especially in spring). Adding white pearls to it would enhance her subtleness. 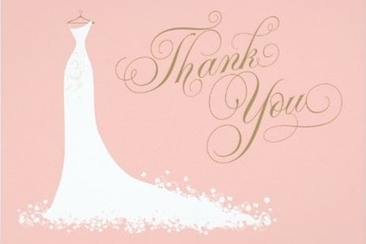 A bride, in tropical surroundings should pick out a bolder look. Decide on a punchy crown made in bright and sizzling colors, with a subtly soft make up. Give your lips a pop of some bold hue like red, pink or maybe some funky shade of purple. Winter is a season of experiment. Not just with flowers, but you can actually add various other winter elements to get the feel of the season. A crown of greenery paired with acorns, or a headband of green ferns would give a nice folksy vibe. To make it chicer, pair greenery with stylish fur muffs or cashmere wraps. If its snowy out there, you can actually sprinkle a bit of snow on your hair, to accentuate the headband’s overall look. Wearing a flower crown does not give you the excuse to forgo the veil. If you love to wear both, you can actually do that. 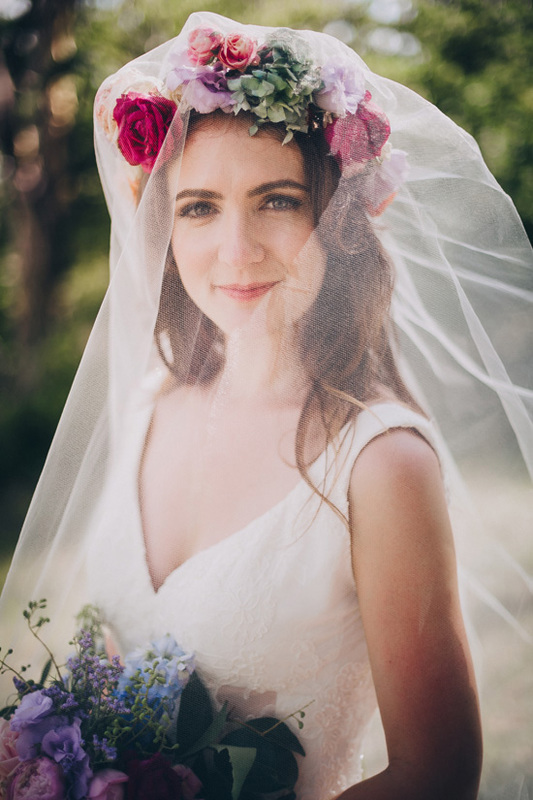 Opt for a single-layered veil with a flower crown. Wearing both together, actually adds a glamorous touch of nature-inspired beauty to your bridal avatar. Recently we have seen a movement of Photoshop flower crowns on Tumblr. People from all across the world participated in it. Quite interestingly, it was a trend where people used to Photoshop the pics of their favorite characters with a flower crown on their head. Most of the people followed this huge trend just for the sake of fun without having any idea of what do flower crowns mean. Right after that people started to Photoshop the pics, not only of Harry Styles, but of all of their favorite celebs. Did it have any symbolic significance? Many people thought it to have any symbolic meaning. Though it was a fun trend but it can be called a symbolism of love and affection. As flowers themselves are a symbol of love and associating something lovely to someone, represents your love or likeness. 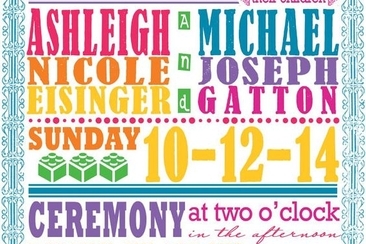 Lego themed wedding invitation would surely make your guests happy. It guarantees playfulness and fun element. Check out how small details can elevate the overall look of lego wedding theme.